Principles of Flight Simulation is a comprehensive guide to flight simulator design, covering the modelling, algorithms and software which underpin flight simulation. The book covers the mathematical modelling and software which underpin flight simulation. The detailed equations of motion used to model aircraft dynamics are developed and then applied to the simulation of flight control systems and navigation systems. Real-time computer graphics algorithms are developed to implement aircraft displays and visual systems, covering OpenGL and OpenSceneGraph. The book also covers techniques used in motion platform development, the design of instructor stations and validation and qualification of simulator systems. 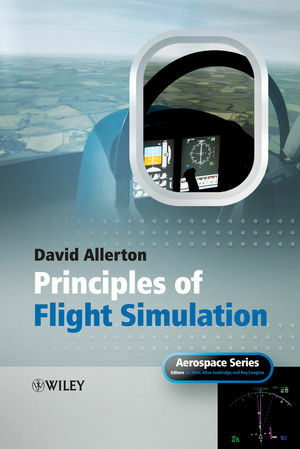 An exceptional feature of Principles of Flight Simulation is access to a complete suite of software (www.wiley.com/go/allerton) to enable experienced engineers to develop their own flight simulator – something that should be well within the capability of many university engineering departments and research organisations. Features full colour plates of images and photographs. Principles of Flight Simulation will appeal to senior and postgraduate students of system dynamics, flight control systems, avionics and computer graphics, as well as engineers in related disciplines covering mechanical, electrical and computer systems engineering needing to develop simulation facilities. David Allerton is Professor of Computer Systems Engineering in the Department of Automatic Control and Systems Engineering at the University of Sheffield. He is a Fellow of the Royal Aeronautical Society (FRAeS) and the Institution of Electrical Engineers (FIEE). He has been a Lecturer at the University of Southampton and the Professor of Avionics at Cranfield University. He has served on several national committees and is a member and past-Chairman of the Royal Aeronautical Society’s Flight Simulation Group. 1.2 The Case for Simulation. 1.3 The Changing Role of Simulation. 1.4 The Organization of a Flight Simulator. 1.5 The Concept of Real-time Simulation. 3.1 Principles of Flight Modelling. 3.11 The Equations Revisited – Long Range Navigation. 4 Simulation of Flight Control Systems. 4.2 Simulation of Transfer Functions. 4.5 Aircraft Flight Control Systems. 4.6 The Turn Coordinator and the Yaw Damper. 5.1 Principles of Display Systems. 5.7 Simulation of Aircraft Instruments. 5.8 Simulation of EFIS Displays. 6 Simulation of Aircraft Navigation Systems. 6.5 Automatic Direction Finding (ADF). 6.6 VHF Omnidirectional Range (VOR). 6.7 Distance Measuring Equipment (DME). 6.8 Instrument Landing Systems (ILS). 7.1 Simulator Qualification and Approval. 7.7 Model Validation in Perspective. 8.2 The Visual System Pipeline. 8.7 Problems in Visual Systems. 9.1 Education, Training and Instruction. 9.2 Part-task Training and Computer-based Training. 9.3 The Role of the Instructor. 9.4 Designing the User Interface. 10.1 Motion or No Motion? 10.2 Physiological Aspects of Motion. 10.5 Implementation of a Motion System. 10.8 Limitations of Motion Systems. Principles of Flight Simulation Visit the companion website to access a complete suite of software to enable experienced engineers to develop their own flight simulator.